3D printing is a process of building a three-dimensional object. Digital files determine the shape of the objects that are printed. 3D printing is an additive process: objects are usually created as very thin layers of material (e.g. 0.1mm) and are added in succession. The 3D printing process is also known as additive manufacturing. 3D printing is often used for prototyping, customisable objects and one-off designs. The digital file defining the shape of a 3D printed object can be easily modified or replaced and each print can be completely unique, unlike in traditional manufacturing processes where alterations involve remaking expensive moulds or adapting established production lines. Recently, 3D printers have also been used for large batch productions as companies have invested in better quality machines. 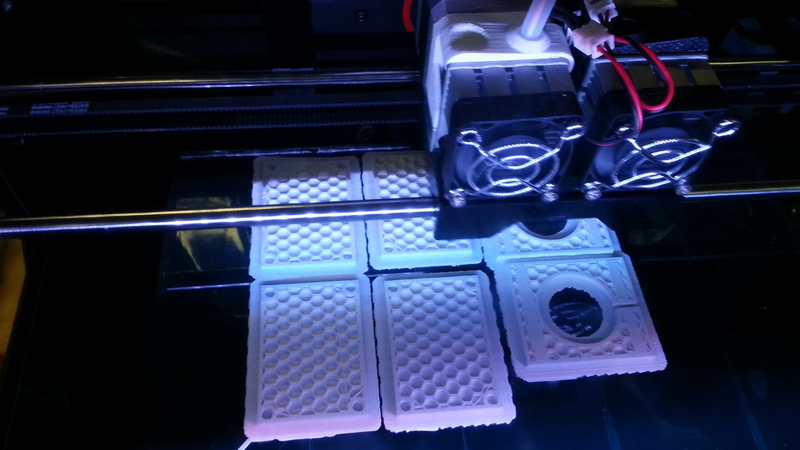 There are a number of 3D printing methods and a range of different print materials. Plastics, ceramics and metals –including titanium and gold – are all printable. There is also a process called 3D bio-printing, which involves 3d printing with cells to build tissue and organs. These 3D printing techniques illustrate the different methods that can be used. This is just a brief summary and there are many other techniques, you should try to read up in more detail before going to an industry interview. Fused Deposition Modelling (FDM) involves the accurate layering of heated plastic-filament or metal wire. High temperatures are used to soften or melt the material and fuse together each layer. The layers harden as the material cools. 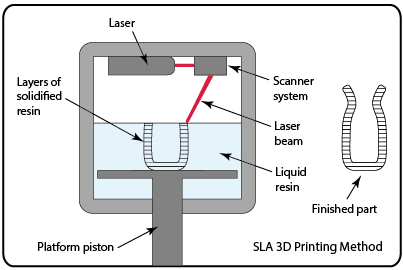 Stereolithography (SLA) uses a photo-reactive, liquid polymer-resin, which is cured (hardened) in layers by a UV laser. With many SLA machines, the platform is lowered every time a layer is cured to make room for the next layer (see diagram). In Laminated Object Manufacturing (LOM) thin layers of adhesive-coated paper or plastic cut into shape with a laser are fused together using heat and pressure. Candidates from many design backgrounds can apply for a role as a 3D Designer, designing objects and products for printing. A design qualification is desirable and 3d modelling or CAD (Computer Aided Design) skills tend to be required. A CAD Designer is a more specific role that involves 3d modelling designs as digital data. Most design courses will have CAD modules. There are also free CAD packages online, such as Blender and SketchUp, which you can learn through online tutorials. It’s definitely worth your while gaining some CAD skills for the more hands-on 3d printing roles. Another common role is 3D Printer Technician. This job involves responsibility for operating the machines themselves and doesn’t necessarily require any design skills however you will need to learn the print preparation software packages required for their particular machines. Experience is always beneficial, so try to get some work experience involving the use of 3D printers before applying to a role. The companies that manufacture the printers themselves need a team of engineers. Most printer companies will also have Service Engineers who will maintain a customer’s printer over time. These roles usually require experience in a similar field as well as an engineering qualification. Software comes hand in hand with 3d printing so there are many Software Developer roles that are available in the industry. A programming/coding qualification like computer science is likely to be needed for this role. There are research and development (R&D) roles in companies that are trying to use 3D printing in innovative ways. Many of these are in the consumer product market, but other exciting research opportunities include roles in biological and scientific modelling, which will require qualifications in the sciences. Roles in architecture include the 3D printing of architectural models and more recently the 3D printing of buildings and structures in the construction industry. These roles will tend to require engineering or architectural qualifications. More and more schools, colleges and universities own 3D printers, providing many opportunities for educational roles. These roles will usually require first hand 3D printing experience, so if you want to teach it’s best to start with a role in industry first. Less technical roles include those in operations and in administrative positions. A growing number of sales positions are also required due to increasing demand for the machines’ services and for consumer 3d printers. Lawyers and Legal Professionals who specialise in intellectual property are important for the industry in order to protect companies and individuals from infringements. You’d be surprised at how many candidates apply for a 3D printing job without understanding what 3D printing is. Let the employer know that you have a good understanding of a few different 3D printing methods and it’s wise to email the company to ask which machine(s) they use prior to your interview, then you can learn about that particular technology. If you don’t have experience with their particular software or technology then show an eagerness to learn. There tends to be a fair amount of training for new starters. Read up on the company and if you can, ask questions in the interview in order to work out how you could be beneficial to them. Many 3D printing companies are start-ups and are still learning the best way to run their business, they’ll be impressed if you can explain how you could improve their performance. Find out about the latest in 3D printing news and advances. Most importantly be yourself and try to enjoy the interview, if nothing else they are good practice. Good luck! A recent Forbes article: 2015 Roundup Of 3D Printing Market Forecasts And Estimates gives a useful overview of key predictions surrounding the industry. We are here to help you with all stages of your career and next steps after university. From deciding what to do to application and interview support, postgraduate study, self-employment, or anything else. Talk to us to find out how we can help you. It is definitely a good time to join the print industry! 3D printing has opened up a range of exciting roles for graduates. The appeal is no doubt boosted by the constant media coverage, plus 3D printing has the excitement factor that traditional printing often lacks. I have a feeling that 3D printing will help glamorise the print industry as a whole, which can only be a good thing.